... 1891 (120 years ago today), in Vienna, Austria, a daughter was born to a mother whom a U.S. intelligence memo would describe as "a Jewish woman of very low birth" and a father who was a lawyer. As a child she studied at the Vienna Court Opera and in her early 20s became pregnant by an Austrian archduke. Married off to a German prince as a means to cover the out-of-wedlock nature of the pregnancy, Princess Stephanie von Hohenlohe (right) divorced in 1920. She embarked on a life amid elite circles throughout Europe -- including Germany, where she was a favorite of Nazi leaders. Before World War II broke out, she worked as a Nazi spy while resident in London; thereafter, she moved to San Francisco. 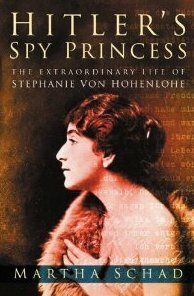 (credit for image of cover of 2004 biography of von Hohenlohe by an Augsburg-based historian, Dr. Martha Schad) Surveilled and eventually interned, von Hohenlohe provided the United States with intelligence respecting Nazi leaders. She was paroled in 1945 and died in Geneva in 1972.